Diva Parties: Diva Parties are for girls aged 4 and up! Divas will enter our exciting LaDeDa Spa, and adorn spa robes. They’ll then be pampered with Diva Hair, “pretend” Makeup, and Nails – and be transformed into a Darling Divas! Afterwards, they’ll head to the Karaoke machine for fun singing and dancing – and then its time for Glitter Tattoos! We have a great party room for our parties and you are welcome to bring in party treats! We’ll take an Awesome Keepsake Photo and autograph it for the Birthday Girl! All girls get to choose a headband from the headband rack ($4.99 value) as their party favor! And only use Ella + Milla nail polish on their nails as it is free of 8 harmful chemicals that most polishes contain! $150 for up to 6 attendees, and $25 for each additional party guest – Parties with 9 or more guests are scheduled for the later party of the day to make sure we have lots of space! We’d love to help make your child’s birthday a special day with his or her friends. 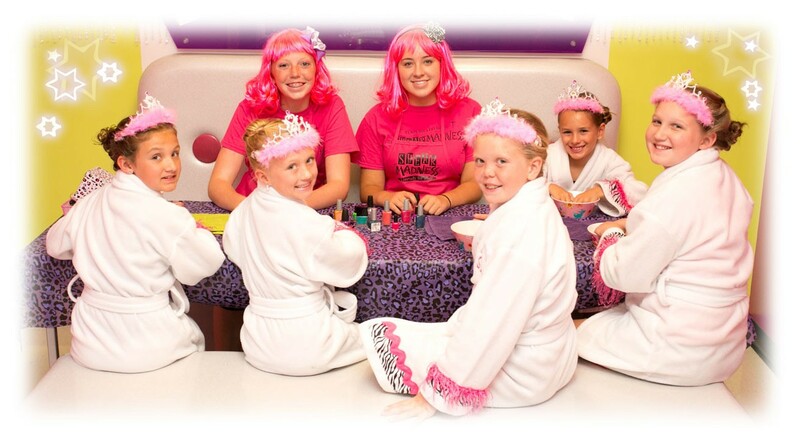 To book your DIVA birthday party please call 816-482-3883! A note on cancellations: Rarely do we have party cancellations, HOWEVER if you must re-schedule or cancel your party reservation you MUST do so no later than 21 days prior to your reservation – or you will lose your deposit. If you have any questions please contact your location for details.